English Rose Funerals provides a truly individual, personal and caring service. Our staff ensure that the person who arranges your service is the same person to attend to your every need during and after your service. We have over 30 years experience helping those in need, we see to every detail needed to conduct a funeral of a loved one here in Adelaide. The need for more personalised services is a growing request. English Rose Funerals was launched at Hope Valley in 2001 with the emphasis on providing quality service at a more reasonable cost. 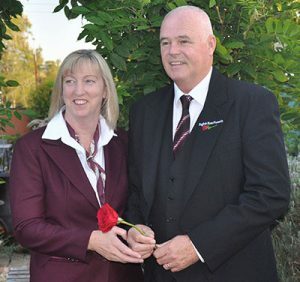 Since then we have grown and English Rose Funerals are now covering all Adelaide Suburbs. English Rose Funerals is Australian owned and we believes in supporting local where ever possible. We endeavour to employ local people. We use local businesses for support and local venues that are convenient to the family. After all, it’s not about us, it’s about you. Our professionalism and dedicated staff are among some of the most experienced in Adelaide and are dedicated to helping you create a fitting farewell for your loved one. We are available 24hrs a day, 7 days a week to help with all your service arrangements and provide a fitting funeral service for people from all walks of life. When you call English Rose Funerals you will speak to one of our experienced staff. We can give you the advice and guidance you need, day or night, 24/7. Based in Old Noarlunga and Seaford, serving all Adelaide Suburbs. Dear Graham & Robyn, Just a quick note to say thank you for the caring and supportive dedication to Tamara’s funeral service recently. Your professional guidance, including your associated Celebrant, Florist, Caterer and Audio Visual coordinators, helped us to sensitively balance the celebration of her life with the grief of our farewell to our beautiful Daughter.